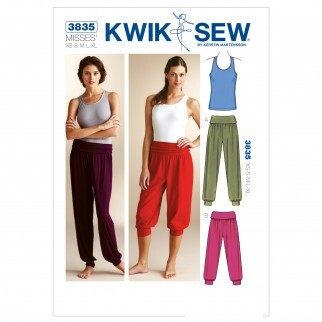 Designed for stretch knits only with at least 50% stretch across the grain. Suggested Fabrics: Cotton Lycra ®, Nylon Lycra ®, stretch velvet. Pattern includes 1 4inch (6 mm) seam allowances. Pull over top has racer style back, shelf bra lining, and neckline and armholes are finished with elastic. Loose fitting pull on pants in two lengths have gathers at waist, wide fold down waistband, and gathers at bottom edges of legs with cuffs. Pants can be made from knits with little or no stretch, but waistband and cuffs must be made from stretch knits with at least 50% stretch.